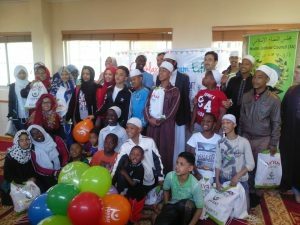 The Muslim Judicial Council (SA) partnered with the Hayrat Foundation and Turkish Airlines to add some smiles to the faces of some of the Orphans aged 10 years and younger in Cape Town for Eidul Adha 2015. Approximately 100 orphans from the various orphanages gathered on Saturday morning the 26th of September 2015 at the Vision Youth and Child Care Centre (VYCCC) in Mount View. The VYCCC is well established in Cape Town and accommodates about close to 70 orphans . The facilitator of the centre is Saadiq Jacobs and his wife Sooraya Jacobs. The centre has been in existence for the past 25 years caring for orphans and striving to find homes and families for all the orphans. MJC President, Ml. Ihsaan Hendricks as well as representatives of the partner organizations delivered talks and partook in the presentation of gifts. As an emotional programme unfolded the guests were introduced to some of the orphans who rendered recitals of the Holy Quran as well orphans who are currently in Quran memorization programmes. The international guests were overwhelmed with their visit to the VYCCC and enthusiastically interacted with all orphans. The Centre also has a medical clinic facility as well as a dental department which has been made available to all the orphanages around Cape Town. 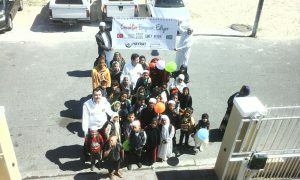 On Sunday morning 27 September 2015 the delegations visited An-Nur Orphanage where further distribution of toys and gift packs were handed over to about 50 orphans, this orphanage in particular hosts mostly indigenous children and immediately after that the delegation re-visted VYCCC to do a further distribution in particular to the orphans who were not present the previous day.